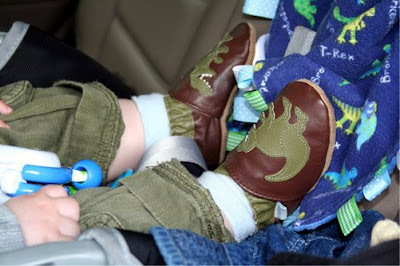 We broke out some new shoes for the boy today that were gifted to us a while back. They have some pretty sweet dinosaurs on them, and frankly I might like an adult-sized pair myself. These are the Robeez T-Rex Slip On , but I'm hoping that maybe someday a forward thinking shoe company (Puma, perhaps?) makes a sneaker for dads that has some slick, removable decor options. I'd totally wear a pair of T-Rex trainers to the gym to show how bad I am, or maybe a running shoe with a little turtle on the side to show my ironic, easy going side. Even if they weren't athletic sneaks, I'd wear a pair with a penguin on the side, you know, to show that I'm cool. When someone pointed at them, and I'm sure they would, I'd just say "it's a new dad thing, you probably wouldn't understand."